Our muscles can store up to 400-500g or around 2000kcal of glycogen to be used as energy. Glycogen is the main fuel you will use during your race and is stored when you eat carbohydrates. Fill up carbohydrate stores, which will reduce the onset of fatigue. Increase your overall carbohydrate intake in the 48 hours before IRONMAN Tallinn. Eat more carbohydrate portions at meal times, including foods such as rice, potatoes, pasta and cereals. Add carbohydrate snacks in-between, such as cereal bars, fruit, or carbohydrate drinks such GO Electrolyte. Aim for 8-10g of carbohydrate per kilo of your body mass, per day. Have a normal breakfast 2-3 hours before IRONMAN Tallinn race. This should be mainly carbohydrate based as our liver glycogen stores decrease over night. Don’t try something new. Eat foods that you’re accustomed such as toast, cereals and juices. Don’t leave breakfast too late. This could cause muscle cramping when we start the race. Hydration before IRONMAN Tallinn race will be crucial. Weather will be hot on the race day. Aim to drink 500ml-1000ml of fluid in the build up to the race. Ideally it means 500ml 2-3 hours at breakfast and 500ml in the build up to the event. Don’t drink just water. GO Electrolyte or GO Hydro can increase fluid absorption and retention. Latter means that there will be less stops for the toilet during the race. Focus on hydration and carbohydrate intake. Our bodies can absorb around 60-90g of carbohydrate per hour. Think through, how long you’ll be competing for and pack enough nutrition to see you through to the end. Here, caffeine should be taken towards the end of your race to give you increased mental stimulation. 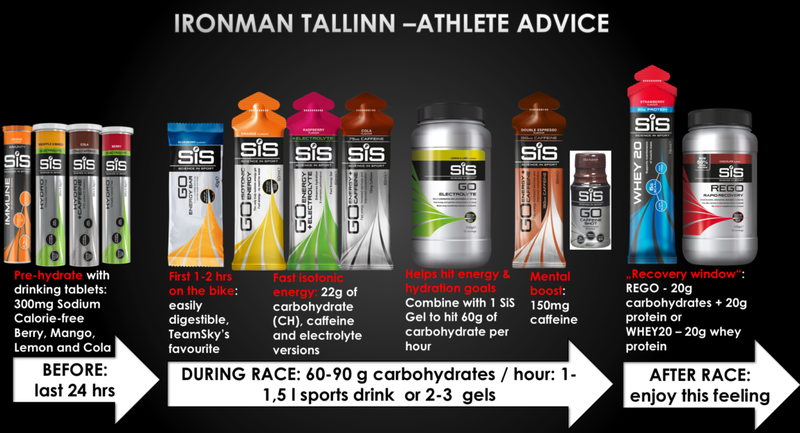 Please print out SiS Nutrition Guidelines IRONMAN Tallinn 2018 and plan everything in advance. Use coupon code SIS10, which gives 10% discount from e-Shop. Tick in the box “Local pickup”. You will get your pack at IRONMAN Tallinn Expo from Sportland’s box. 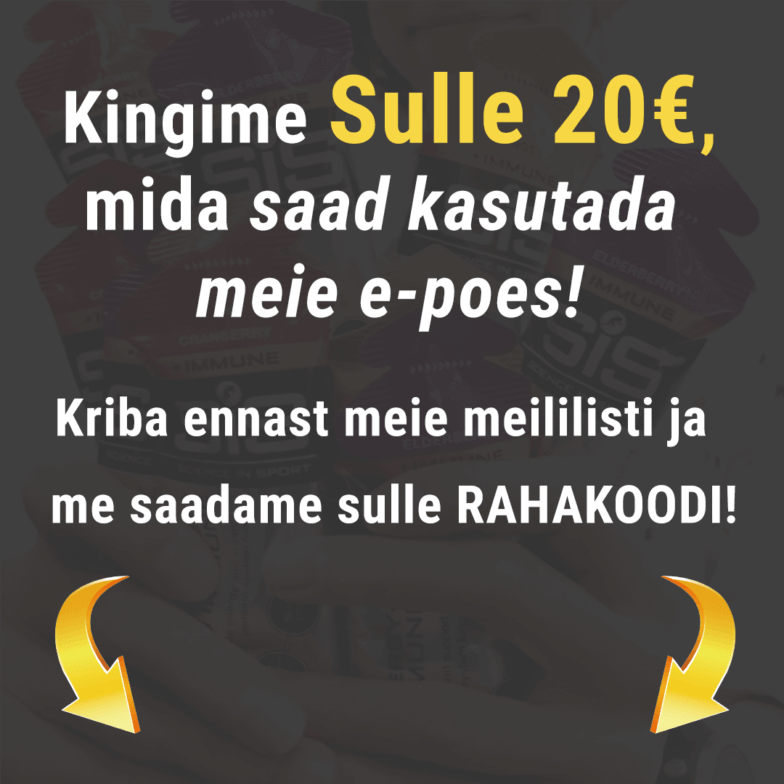 We recommend Endurance Bundle, which consists all necessary products from energy to receovery for your tough challenge ahead. These guidelines were prepared in cooperation with Ted Munson MSC, Performance Nutritionist at Science in Sport. Have a successful race day!